The way a gate with a chain latch is closed is important. If closed the wrong way, a gate with a chain latch can come open under stress, such as when cattle or horses bump into it or crowd against it. Fortunately, closing a gate with a chain latch is easy. We show one correct way of doing it in the simple steps below. Below: A gate with a chain latch closed securely. Below is an example of a poor way to close a gate with a chain latch. Notice that the chain goes around the fence post, then is placed into the notch on the gate. Closing a gate like this is not very secure. If the gate should come under stress (be bumped into, pushed on, etc.) the chain is liable to bounce upward out of the notch, allowing the gate to come open. Below: A poor way of closing a gate with a chain latch. 2) ...finished by placing the chain into the notch (blue arrow). 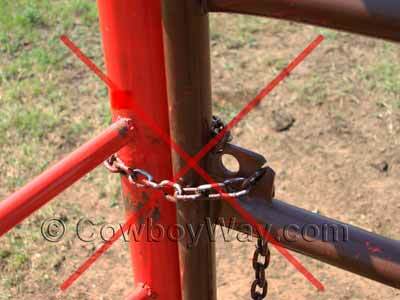 When closed like this, stress on the gate will cause the chain to get pulled deeper into the notch, not bounce out. 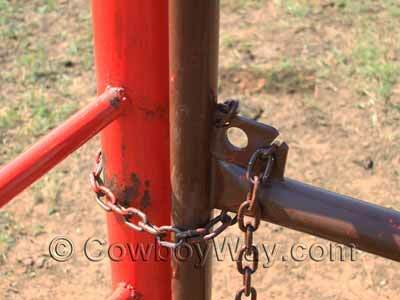 Below: A more secure way of closing a gate with a chain latch. As you have probably noticed, the gate in the photos has a round hole by the notch the chain goes into. Using this hole provides at least a couple of other good ways to close the gate. One other way, for example, is to take the chain around the fence post, through the hole, then place the chain into the notch. There are at least a couple of variations on this, but they serve the same purpose: It's another way of keeping the chain from bouncing out of the notch when the gate is under stress. So, why didn't we use the hole in our demonstration above? Because a lot of gates don't have a hole to use. Taking the chain under the bar before dropping it into the notch  without using a built-in hole in the gate  simply makes for a more universal demonstration.